﻿Let me preface that you need more than three nights in Barcelona! We could have spent all nine nights here - there's that much to see and do! We booked our first three nights at the Regencia Colon Hotel, an extremely well-located, 50-unit hotel in the Gothic Quarter of Barcelona. From the moment we arrived (jetlagged) around noon, the front desk staff could not possibly have been more helpful and professional, storing our luggage until a room was available, enthusiastically giving us maps and directions, making restaurant recommendations and reservations for us. Pricing per night was approximately 100E or $135US. The hotel's location was EXCELLENT. Extra bonus: From the airport, we took a bus to the beautiful Catalunya Square, and easily walked with our luggage to the Regencia Colon Hotel. Within minutes, we could walk to Las Ramblas, the waterfront, the Picasso Museum, El Born district, which we really enjoyed, and many lively tapas bars. The Cathedral was right outside the hotel. We were also able to pick up the Bus Touristic there, which very conveniently took us parts of the city that were too far too walk, like the Sagrada Familia. Additionally, we were able to walk to trains that took us to Sitges, for a day of swimming, sunning, eating and exploring. 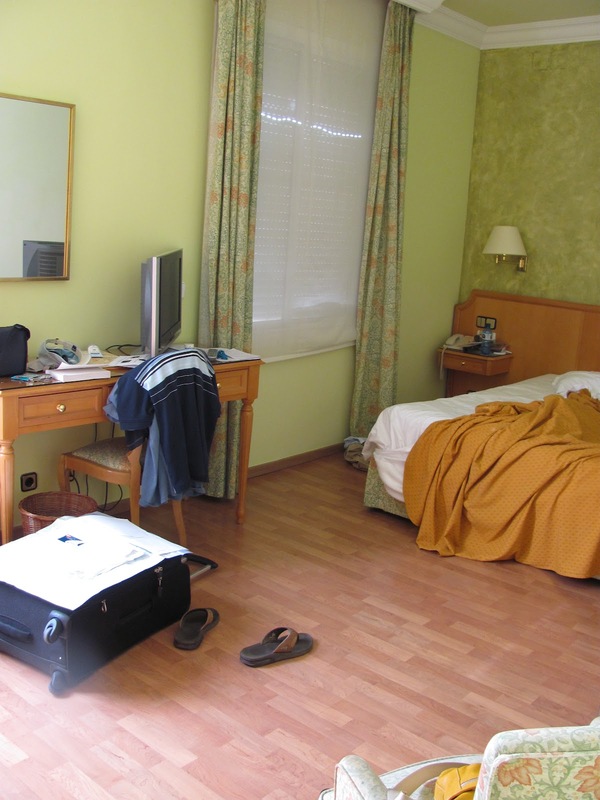 Our double room was spacious and clean. I brought earplugs in case of outside noise but did not use them at all. We felt completely safe at all times and were pleased that the room had a hair dryer, safe-deposit box, a mini bar and some powerful air conditioning . Breakfast was not included but we found some delightful outdoor spots close to the hotel. 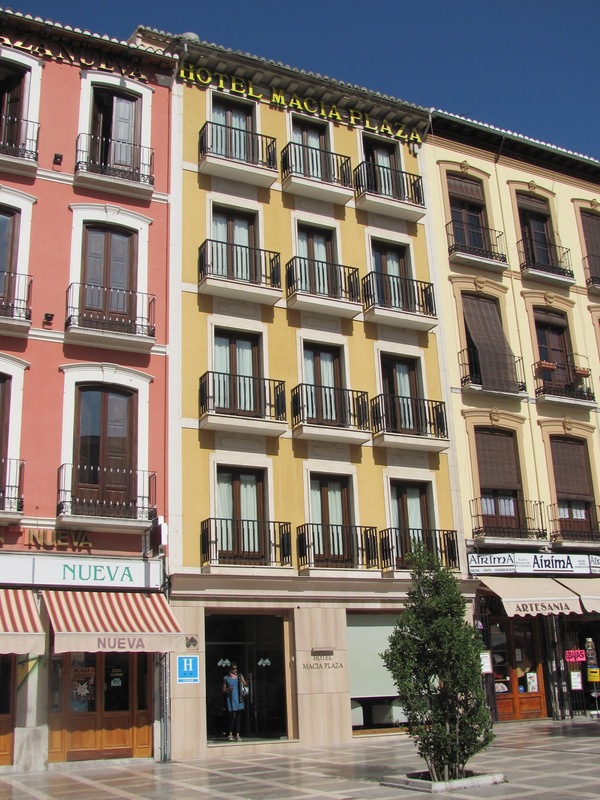 The Hotel Macia Plaza was the best hotel of our trip, and the least expensive! This 44-unit hotel’s location cannot possibly be any better. Two nights in Granada however was just enough time to tour the Alhambra and the city sights and take advantage of the delicious tapas bars. And the best part? We paid 60E per night but I noticed on the website that the rate is currently 75E or $100US per night. From the airport, a bus dropped us off five minutes from the hotel and we easily walked with our luggage to Plaza Nueva, home of the Hotel Macia Plaza. The gentleman at the front desk was kind and helpful and we liked that there was someone there to assist us 24/7. Our room was clean and very modern, and located toward the back of the hotel, which worked for us because it was completely quiet, no noise from the Plaza Nueva. We liked that there was a computer with Internet access in the breakfast room, which we used at no cost to us. Breakfast was nothing fancy but enough to get you going. There are plenty of shops to grab coffee and pastries nearby as well. ﻿Plaza Nueva is a cute square lined with bars and restaurants. The bus to the Albayzin Moorish quarter stopped right outside the hotel and the bus to La Alhambra stopped just down the road, very convenient. (The Alhambra in Granada is Spain’s most visited attraction and should NOT be missed.) We could also walk to both of these sites, as well as the cathedral and chapel. 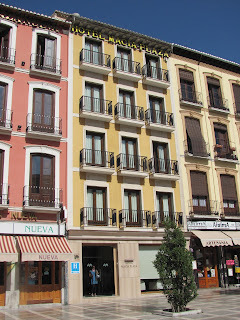 All in all, we were very pleased with the Macia Plaza and highly recommend it to other travelers. Hotel Murillo is located in the charming, pedestrian-only neighborhood of Santa Cruz, just a short walk from the Cathedral and the Giralda, the Alcazar and Murillo gardens, Sevilla’s main attractions. We arrived in Sevilla via train from Granada at the Santa Justa train station. At the station, we easily hailed a cab which brought us to the outskirts of the Santa Cruz neighborhood. Because cars are not allowed, we easily rolled our luggage to the Hotel Murillo, where we stayed for four nights. We paid around 75E or $100US per night. The gentleman at the reception desk was very friendly and because our visit was a special anniversary, we received an upgrade to a suite. Our room was small, with marble steps that led to the bed, a small but comfortable couch, a marble bathroom and a small outdoor patio. The hotel served breakfast (for a fee) in the hotel’s lower level; we ate here once and regretted it. The fruit was canned and the rest was nothing to write home about. ﻿The BEST part of staying in this hotel was its location in the Santa Cruz neighborhood. With its narrow streets and alleys, intimate squares, history and architecture, the neighborhood is amazing, especially at night when the night-blooming jasmine comes out. Very interesting post about your Spain trip. It seems you enjoyed your visit to our country and that´s always good news for us. We wanted to thank you for your comments on our hotel (Murillo). First hand comments are very useful for us (we have already changed the hours of the terrace bar and we´ll definitely try to improve our breakfast service) If you remember any other point of improvement, I´d appreciate if you could send me an email. Nice blog! I would totally consider spending the money on these hotels for one night, it would be so fun! I will invite my friends to go in barcelona and stay on these hotels. Thank you for sharing! We’ve allied ourselves with 800 airlines around the globe to provide you with only the best flights deals that your local travel agencies could only dream of getting! Simply input your destinations and flight dates in the form above and we’ll do the rest to connect you with the world’s most economical airlines that match specifically to your criterion! Excellent read, I just anesthetized this assimilate a aide who was accomplishing a little analysis on this topic. And he in fact bought me cafeteria because I begin it for him. So I should acknowledge you for the chargeless cafeteria I got. Barcelona Budget is your one-stop Barcelona, Spain biking guide. Let us be an adviser not just to all things Barcelona, but aswell to absurd savings.. Sign up for our up-to-date, advice arranged updates on all things Barcelona, alignment from events, biking tips to deals and more. A very interesting read and a great post all together. Thanks for sharing.